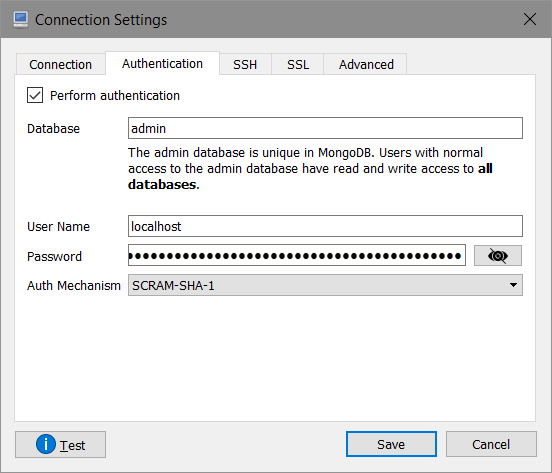 In the connection settings dialog, set the address as localhost and set the port as 10250 (This is the default Mongo port, you can change this with commandline parameters). Now select the Authentication tab, where you need to select the Perform Authentication checkbox. Set the Database value as Admin, Username as localhost and password as C2y6yDjf5/R+ob0N8A7Cgv30VRDJIWEHLM+4QDU5DE2nQ9nDuVTqobD4b8mGGyPMbIZnqyMsEcaGQy67XIw/Jw== (This is default password for emulator, I don’t think you can change it). Keep as Auth Mechanism as SCRAM-SHA-1. No need to change anything in the SSH tab. 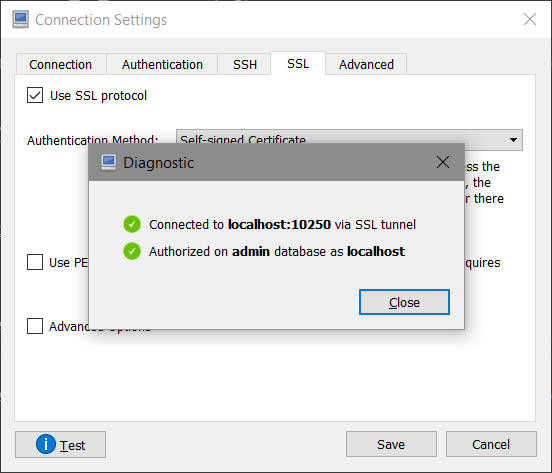 In the SSL tab, check the Use SSL protocol checkbox. And select the Authentication Mode as Self-signed Certificate. No need to change in the Advanced Tab as well. Now you can click on the Test button to verify whether everything is working properly. 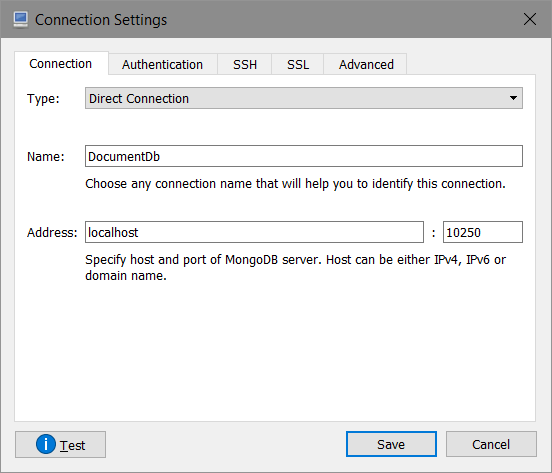 Now you can save it select the Connect button from Mongo Db Connections dialog. If you want to use it from C#, you can do something like this. You can copy paste the connection string, it will work with Azure Cosmos DB emulator every where.